Two Artesia residents were arrested Wednesday evening following a shooting incident that resulted when an altercation between acquaintances dangerously escalated. 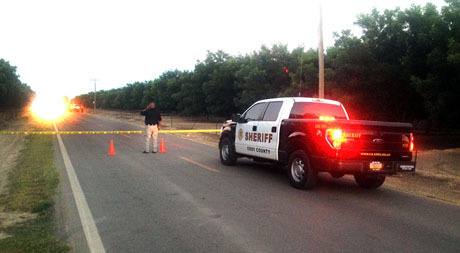 Eddy County Sheriff’s Office deputies were dispatched just after 6 p.m. Wednesday to the area of Richey Avenue and East Mill Road in reference to shots fired from one vehicle toward another. Upon arrival, deputies located a silver sedan matching the description of one of the vehicles involved. Just prior to executing a high-risk stop on the sedan, deputies observed an object being thrown from the vehicle. “Deputies were able to stop both vehicles involved and, through the investigation, we were able to determine that one of the vehicles containing three people had actually shot at the other vehicle,” Sgt. Matt Hutchinson of the ECSO said today. After stopping the sedan and detaining the occupants for questioning, deputies located the item thrown from the vehicle: a bag containing firearms. Further investigation revealed the altercation had begun as a fight between two females at the Allsup’s convenience store at First Street and Richey Avenue. As the altercation left that location, Hutchinson says, the vehicles continued east on Richey Avenue, at which time one pulled alongside the other and fired several rounds. One shot struck the target vehicle, piercing one of its doors; however, no individuals inside were harmed. Michael Martin, aka Casper, was arrested on four felony charges, including aggravated assault with a firearm, possession of a firearm by a felon, possession of a stolen firearm, and tampering with evidence. Amanda Sosa, who was in the company of Martin, was also arrested and charged with aggravated battery. The incident remains under investigation. Anyone with potential information is asked to contact the ECSO at 575-887-7551.